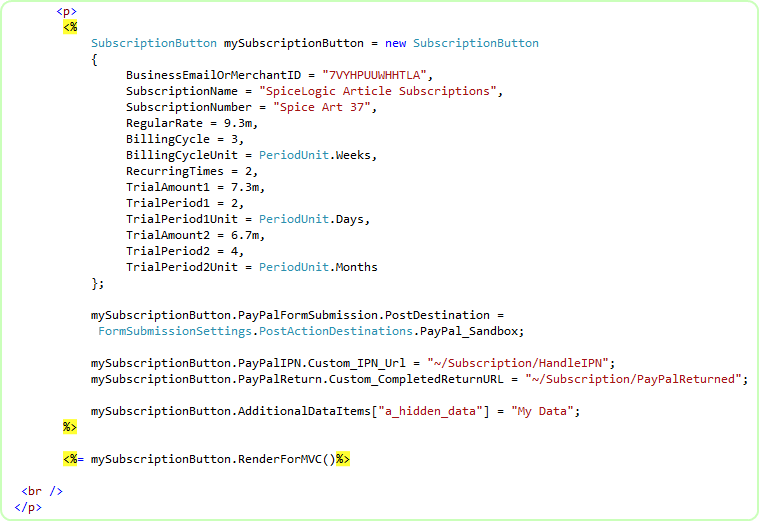 This chapter explains the usage and facts about Subscription Button for ASP.NET MVC. If you want to learn about the Web Form Control, please visit this page. PayPal Subscriptions and Recurring Payments let you accept recurring payments for your service. 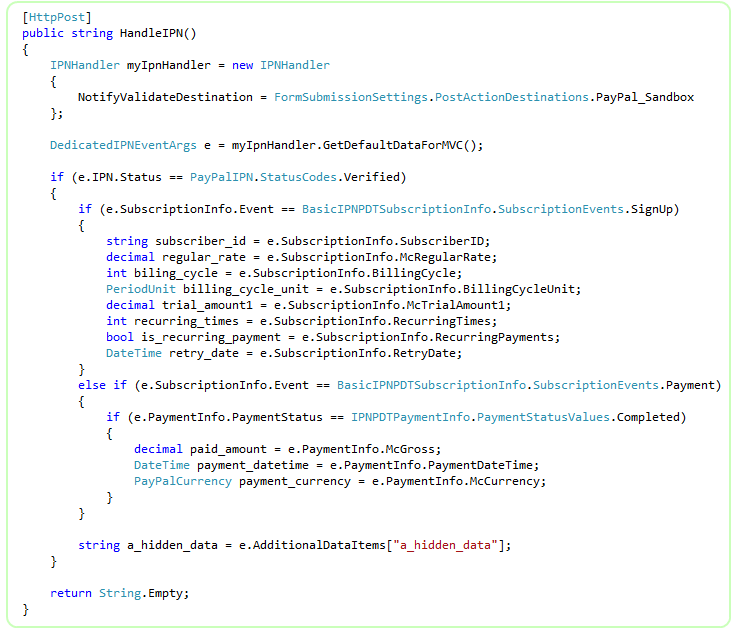 Our Subscription Button Control is designed to facilitate you to use that PayPal offered service within your ASP.NET Web site in the most organized Object Oriented way. When you set up Subscriptions, you can offer subscribers a trial period, special introductory rates, and a regular rate. Subscribers are billed automatically according to the terms you specify, removing the hassle of keeping track of which payments you have and have not received. PayPal Subscription buttons can also help you improve your buyer experience with customizable buttons, secure payments, and the ability to pre populate your subscribers’ PayPal sign up pages. PayPal provides Instant Payment Notifications to give you instant notification of all subscriptions activities and to facilitate Subscription Password Management. If you are evaluating a Trial Version of this control OR if you want to test with Demo Money, please prepare your Sand Box account before proceeding to this chapter . Import the namespace "SpiceLogic.PayPalCtrlForWPS.Controls" and create an instance of the component 'SubscriptionButton', set the properties and finally call the method RenderForMVC(). You can do that either in your Controller's Action method or in your View page. As soon as the IPN is notified to your server, the Action Method you defined by the property PayPalIPN.Custom_IPN.Url will be called. In your Action method, you can instantiate an instance of the component IPNHandler and call its method GetDefaultDataForMVC. This method will return all the transaction data from IPN and offer you a rich set of strongly typed relational object model. You should import the namespaces "SpiceLogic.PayPalCtrlForWPS.Controls" and "SpiceLogic.PayPalCtrlForWPS" in your Controller Class. Click Here to view the complete Class Diagram of DedicatedIPNEventArgs object. Whenever your customer is transferred back to your website from PayPal website after completing or canceling a payment (pursuant to submission of your Buy Now button), you can execute post payment business logic. If you have defined a PayPal Return URL property (as shown in the first screenshot) in your BuyNow button, then the PayPal Return URL will be called. 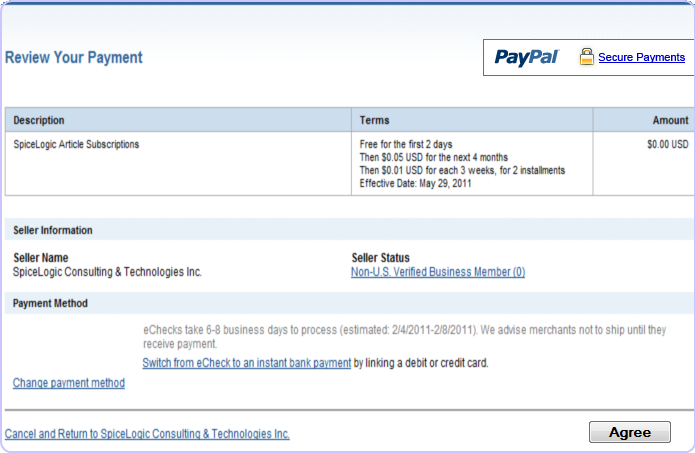 The Action method we used (shown in the first screenshot) for PayPal Return was "PayPalReturned" which is defined in the controller "Subscription". So, the PayPalReturned Action method will be invoked as soon as the customer is taken back to your site from PayPal website. 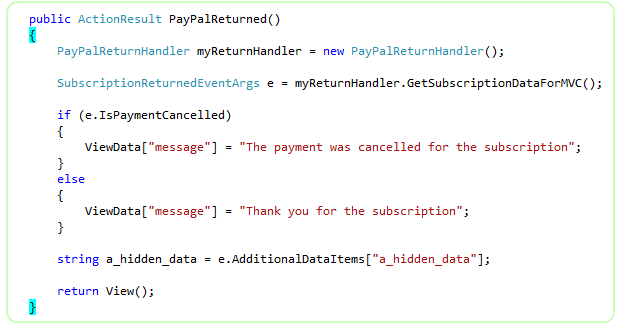 In this action method, you can instantiate the class PayPalReturnHandler and call the method "GetSubscriptionDataForMVC()". 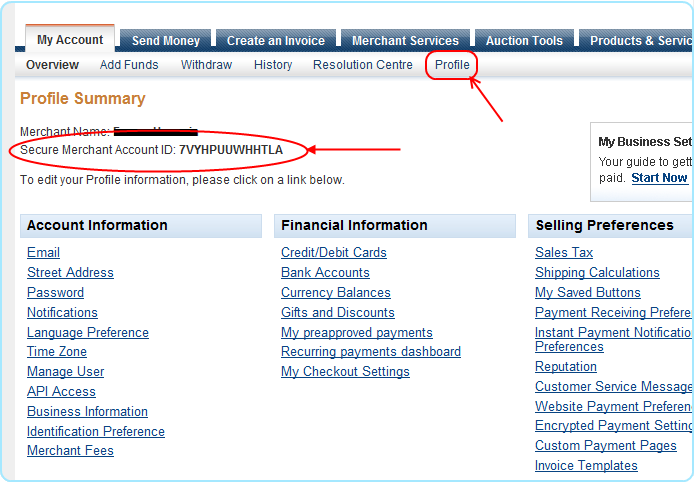 This method will collect all the transaction data from PayPal if you have turned 'Payment Data Transfer' option ON from your PayPal profile. You should import the namespaces "SpiceLogic.PayPalCtrlForWPS.Controls" and "SpiceLogic.PayPalCtrlForWPS" in your Controller Class. 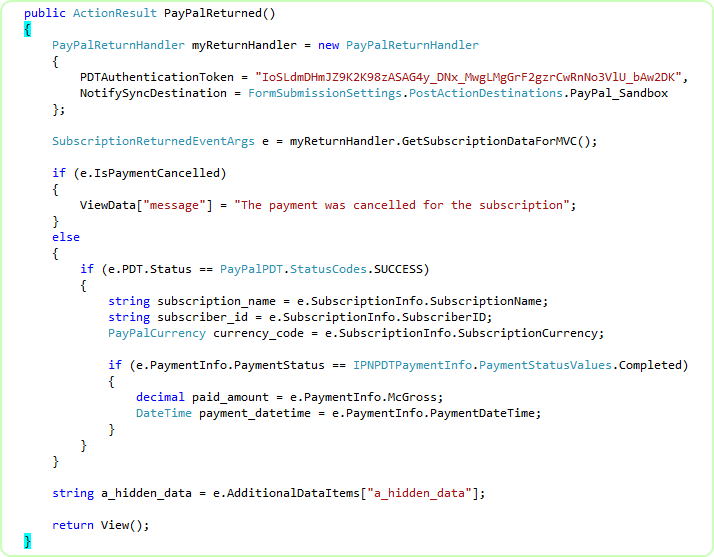 If you want to receive all the transaction data in the PayPalReturned action method from the SubscriptionReturnedEventArgs object, then, you need to turn 'Payment Data Transfer (PDT)' option On from your PayPal account. Once you turn PDT ON for your PayPal account, you will receive an Authentication Token which is called 'PDT Authentication Token'.